OAKLAND, Calif. -- A former security guard at Oakland High School was handcuffed and taken to jail Tuesday after a jury convicted him of one felony count of assault with force likely to produce great bodily injury for attacking a student who suffers from cerebral palsy and uses a wheelchair. The jurors, who deliberated for a day and a half, acquitted 24-year-old Marchell Mitchell of three other felony counts: two counts of inflicting corporal injury on a child and another assault count. But jurors did convict Mitchell of a misdemeanor battery count that was a lesser included charge in one of the corporal injury counts. The incidents stemmed from a confrontation Mitchell had with student Francisco Martinez, who is now 18, at Oakland High School on May 19, 2014. Martinez testified that Mitchell dumped him out of his wheelchair and punched him four times while he was handcuffed. But Mitchell testified that he believes he was justified in using force against Martinez because the student was actively resisting him and threatened to kill him. Mitchell alleged that Martinez is a gang member who was one of the most unruly students at the school and disobeyed orders to go to class during the incident, which was captured on video. Mitchell, who was fired after the clash, was free on bail until he was convicted of the one felony count on Tuesday. He's scheduled to return to court on Wednesday to have a sentencing date set. Mitchell's lawyer, Nabiel Ahmed, said he was hoping that Mitchell would be acquitted of all the charges against him but said he "respects" the jury's verdict because it spent a lot of time evaluating the case. Ahmed said Mitchell would have faced up to seven years in state prison if he'd been convicted of all the charges against him, but now will only face four years at the most. Prosecutor Gemma Daggs wasn't immediately available for comment. 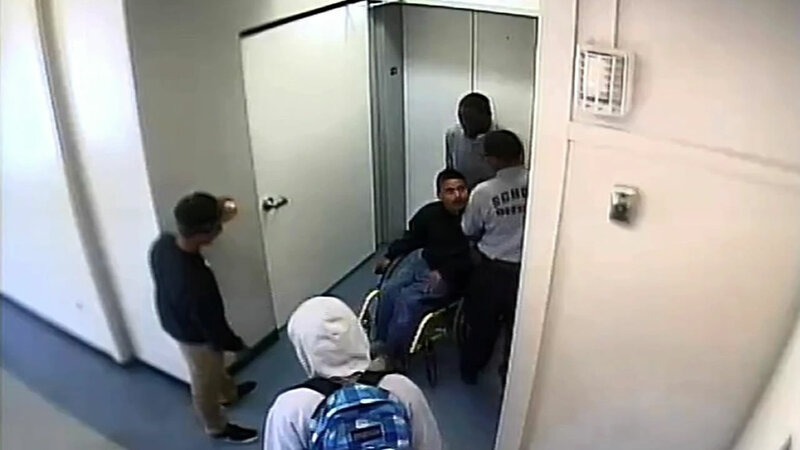 Martinez filed a lawsuit against Mitchell and the Oakland Unified School District alleging that he was the victim of excessive force, but his lawyers recently reached a settlement with the district for an undisclosed amount.